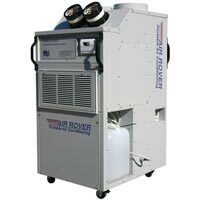 Air Rover XL Series portable HVAC systems provide environmental stability for a wide range of spot cooling applications. Air Rover’s XL Series portable air conditioners can be deployed in a corner on the floor or mounted on a wall or ceiling. If preferred, the units can be positioned in a separate room with cold, filtered air ducted via floor, ceiling, or wall vent. Highly configurable and easily deployable, XL Series air conditioners provide a stable environment for computer equipment and significantly improve the comfort level in corporate office areas. Adjustable directional air nozzles. Adjust 180o and tuck away for safe and easy transport. Programmable Thermostat (24Vac), unit- or wall-mounted. Can interface with building computer operation systems. Vacuum-formed internal drain pan with two drain openings on opposite corners. Unit shuts off if clogged.